May or may not be "perfect form," i just put that there for more views. And my voice sounds weird in those vids... i do NOT sound like that. wth?? It's perfect form alright. More in the tank as well, it looked way too easy. And your voice will always sound different recorded than in your head. That's awesome man. What did you set your max at on smolov to start? I set it at 335lbs and it was tested the Friday before week 1, which started on Monday. 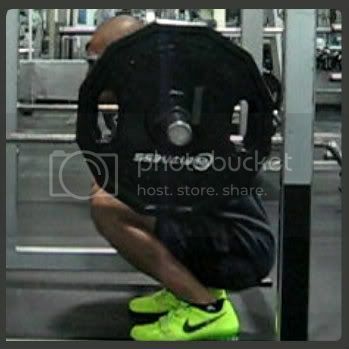 So 335 was your true 1RM or was it lower? If so, what was the gain on Smolov? it was true but it wasnt an all time pr. some of the gains were re-gains after 3 months. So my link is what you did? interesting about the bar, because the bar i use @ 24hour fitness is a bit thicker than my bar at home (which is 45 lb), one day i should measure it and see, would be cool if it's 55 lb, might explain why my squatting is weaker at the 24hour fitness than at my home gym. u sound like that bro. 405.. because 3 plates is not cutting it anymore..